Margaret has a Masters (Sociology) from the London School of Economics and some 30 years of print and online media experience. She held senior editing positions at The Business Times, The Singapore Monitor, and TODAY, and was founding team of Singapore Press Holding’s Internet arm, Asiaone. She was involved in media coverage of women’s issues and social/political matters as a journalist. She now works primarily on book projects. A member of AWARE’s Board since 2009, Margaret was part of the team overseeing the professionalization of AWARE. 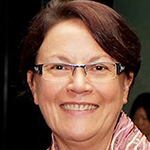 In April 2018, Margaret was elected President of AWARE and will continue to oversee the effort to expand AWARE’s services and strengthen its position as a leading civil society organisation in Singapore.